The Spice Chef has made a clever little spice packs which are pre-measured and freshly ground, with no preservatives or artificial flavors. Each kit includes a shopping list and a recipe card for you to make a delicious dish for four in no time. "Cooking your own has never been this easy." 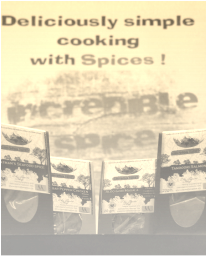 Spice chef takes pride in making the spice blends, all hand made in small quantities, in Toronto, ON, Canada. With no salt, preservative or artificial flavours in it's spice blends. So what you get is spices. Each spice kit serves 4 to 6 people, so use what you need. Online Store: If you wish to get the quote on shipping options, we will contact you and give you a ref# so that you can pay the amount after confirmation. Online Shopping in your own style. we will try minimize the shipping cost for you. and will contact you for additional cost if incurred.